From 1931 the Company was managed by the son of Alex Scott, Stewart Scott, and in 1993 Alex Scott & Staff was formed, providing Staff the opportunity of acquiring a shareholding and to form a Board of Directors with Bruce Gibson remaining as Chairman. This board of family and staff shareholders has overseen a further expansion of the Company, particularly in relation to the Real Estate Division, which combined with the extensive and long established Livestock interests provides a most vibrant and well informed Agency. With offices in Berwick, Cowes, Grantville, Inverloch, Korumburra, Lang Lang, Leongatha, Pakenham, Venus Bay , Warragul and Wonthaggi, Alex Scott and Staff is well positioned to continue to serve its clients from the mountains to the Sea. 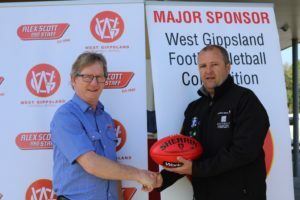 Alex Scott and Staff is proud to be the inaugural naming rights sponsor of the newly-formed West Gippsland Football Netball Competition. Physioworks Health Group is the sports medicine partner of the Alex Scott and Staff West Gippsland Football Netball Competition. Physioworks Health Group provide committed excellence in General Physiotherapy, Sport Physiotherapy and Specialist Musculoskeletal Physiotherapy care and treatment. Headed by Specialist Musculoskeletal Physiotherapists Andrew Dalwood and David Francis, Physioworks Heath Group have been successfully treating patients for over 25 years, operating a network of multi-discipline health care clinics across Melbourne.